Bill Nangle, George Leduc and Eugene Pellerine. 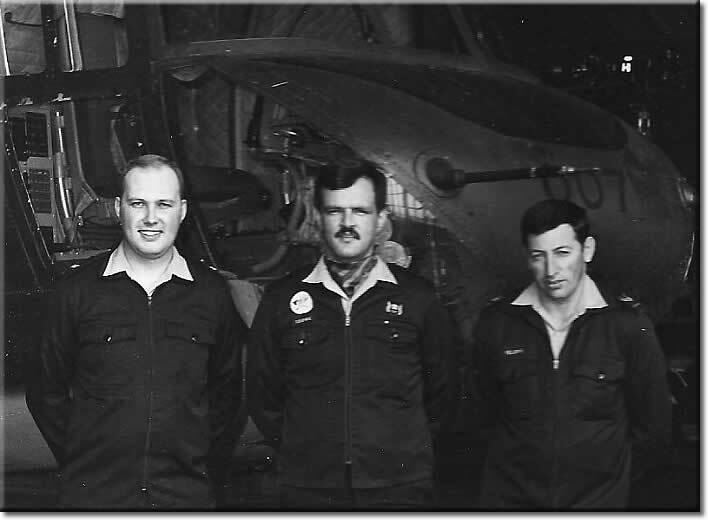 I believe it was when Bill and Eugene got their LM wings for the Chinook Helicopter in Ottawa, around 1985. Sure brings back some old memories. Correct George, it was in 1983, Loadmaster Course #8301, 450 Sqn, CFB Ottawa South. I note that you're not a member of the OBA yet... regret you don't qualify for a prize. I will take a shot at this photo of the Chinook loadmasters. The handsome devil in the centre is WO George Leduc (Ret.). He is wearing the 450 Helicopter Squadron crest and the Loadmaster Balance Bar wings on his tunic. The no-name guy on his left later re-mustered to another trade, can' t remember his name. 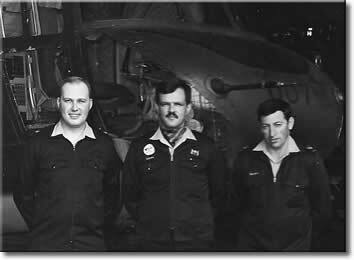 The guy on his right, his first name is Dan and went on to fly with 447 Helicopter Squadron in Edmonton. This is pretty ironic because they got rid of the Chinooks around 1993 and bring them back in January 2009. 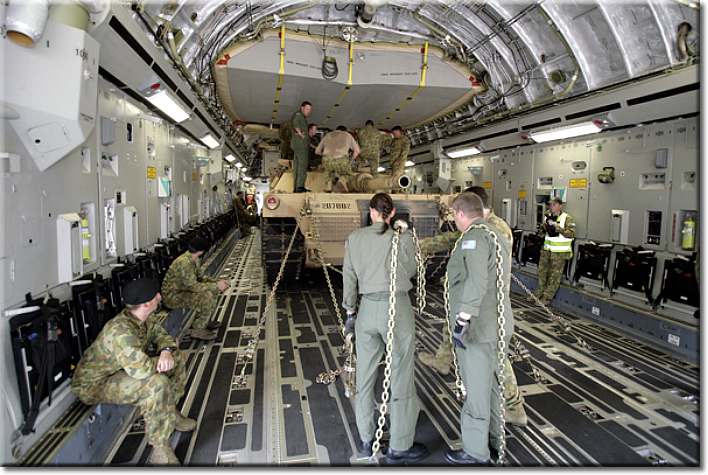 The main role is to airlift troops, sling loads and carry equipment for the Army. They can go to many remote locations in the world. Thanks for the interesting background info on the Chinook Steve... pity you couldn't guess all the names on the LM course. One of many trips from Devils Lake, Northern Ontario, during the forest fire evacuations to Winnipeg, Manitoba. I think I see MWO Shearon. 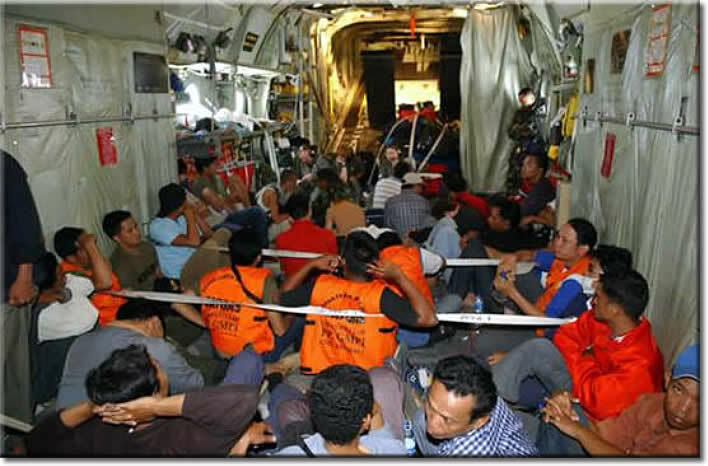 I can see how you might think that was Northern Ontario Gerry... it was actually the other side of the world; The Royal New Zealand Air Force airlift of refugees in Indonesia after the Great Sumatra-Andaman undersea earthquake on 26 December 2004, which caused what became known as the Asian Tsunami (or the Boxing Day Tsunami). Is that Melinda Cotton in the picture? 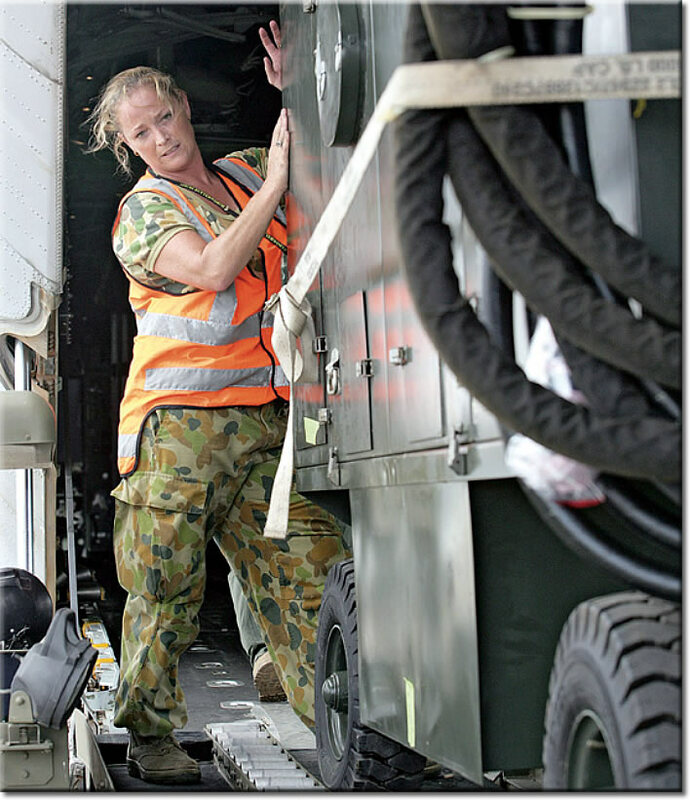 Yes Pete - In April 2007 Sgt Mel Cotton helps unload equipment for 1 and 75 Squadrons from an RAAF C-130 at RMAF Butterworth, Malaysia. From: John Bell, Cairns, Qld. Your letter in the OBB has really stuffed up my memory banks. I had always believed a slightly different version of the CTC drinking saga. I thought it had happened at El Adam during Operation Dazzle. This was during a 4 week tented deployment in Sep/Oct 1965. My memory, now obviously scrambled, was of you leaving your coke on the windowsill in the crew room to deal with a turnaround, dashing back in after the onload, all hot and sweaty from the Libyan climate, and swigging from the (wrong) bottle. Just like folk lore I expect I was told the tale second/third hand and by then it had been embellished and my mind further warped the real facts. I am unable to help on the crashed Argosy because I left UKMAMS on 24 Nov 1967 for a 6 month detachment to the US Army as part of a SEATO Group in Northern Thailand during the Vietnam War. Lots of “war” stories there but not now. 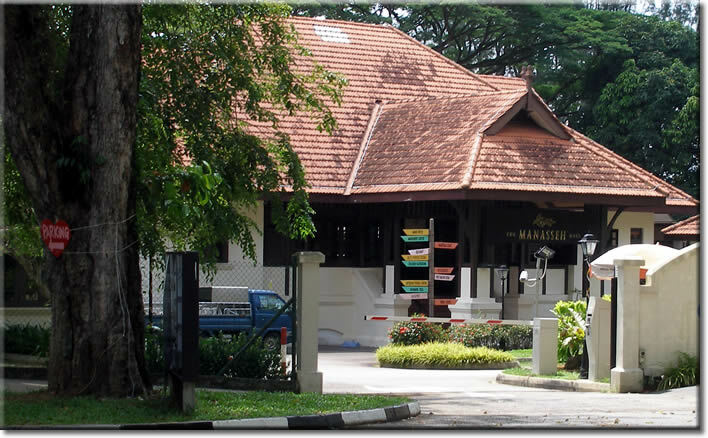 I went from Thailand to do a full tour in Singapore in April 1968 and would have been there when the Argosy went in. Our paths crossed a few more times. Years later in Norway a group of international movers were sitting in their tent and discussing the world political situation, as we did frequently, when you walked in with a case of beer on your shoulder. I cannot remember the reason or if there was a reason but I can remember the beer. Years later again I was working at HQSTC on logs planning for ops and you were something to do with fuels at MoD I believe. Again, the memory might be buggering me around but that is what the faint flicker at the back of my mind appears to be saying. John, thanks for sharing. Perhaps you can regale us with tales of Thailand and Vietnam before too long? Thanks again for another great Old Bods newsletter. 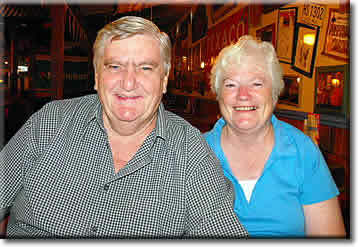 Pleased to say I have now heard from Steve Broadhurst in Oz, he is safe & well after the bush fires. Must respond to his e-mail though! One on the way soon Steve. At last someone has tried to work out the RAF Mystery photo of mine (122408). Ok DC I will give you a clue: the country involved has a railway station that actually belongs to ANOTHER country! The picture was taken just over fourteen and a half miles from that station that is in the city. I cannot make it any easier than that. I hadn’t realised that we only overlapped for just 4 months in 1967 at Abingdon, felt much longer. Our paths did cross subsequently, but like you I can’t pin down the actual dates. I did two spells at HQ Strike Command; 82-83 in the Logs Ops (Supply 3B) slot. 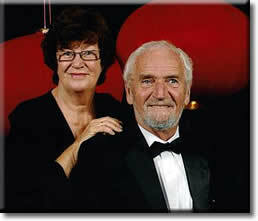 I was replaced by long tall Geoff Clark – he and Sheila still live in Princes Risborough and Geoff is an RO at the MoD. Now one from my battered grey cell memory bank, but around the time we overlapped on UKMAMS, was there an incident when one of the teams managed to load a Beverley so that it didn’t trim – vertically? ‘bottle and 200’ = an overseas trip where our duty free allowance enabled us to bring a bottle of sprits and 200 cigarettes back through UK Customs. David, Could you perhaps provide an explanation for the term, “Rollo Free Lunch” ? If wet in Town Hall. To return to Rollo, he was the archetypical business wheeler dealer and general schmoozer, who invariably developed his many contacts with the opening ‘I say fancy a spot lunch?’ And, I will be quite open, that was the way we in the provisioning branches developed our relationships with our suppliers in those happy years of yore. I dare say that in today’s squeaky clean environment, one would probably have to decline the offer of a polo-mint. But at least in the fuelly world we did return the largesse by the annual DDSpol10(RAF) infamous Christmas lunch party which was usually held in the Henry VIII Wine Cellar in the basement of the Main Building, and to which all those who had hosted us during the year were invited. These festivities started at midday and went on, and on. What’s more, unlike the hosting we had enjoyed during the year which would have gone on the relevant company’s expense account – actually we as the hosts put our pro-rata hands in our pockets and picked up the tab. In addition to some ‘lumpy’ for blotting paper, the main ingredients were Guinness, Brandy (cheap), Champagne (cheap) and Orange Juice which could be taken straight or mixed in various combinations, e.g. Black Velvet, Champagne Cocktails, Bucks Fizz etc. On a serious note, in the fuels world, you didn’t have a lot of stock on the units, often days rather than months. This meant that on occasion you had to work very quickly with solutions to supply problems set up over the phone working with your contacts in the fuel companies. Obviously one exercised propriety and maintained clear water when contracts were being negotiated, by once contracts were signed, normally for one or two years for the supply by road or pipeline to a clutch of RAF stations, then both sides worked hard at building a close professional working relationship – lubricated by the occasional ‘spot of lunch?’. Finally, did you know that anything called Henry VIII’s, usually wasn’t. He had probably nicked it. In the case of the MoD wine cellar – from Cardinal Wolsey. Thanks for the latest, always enjoyable, Old Bods Brief. 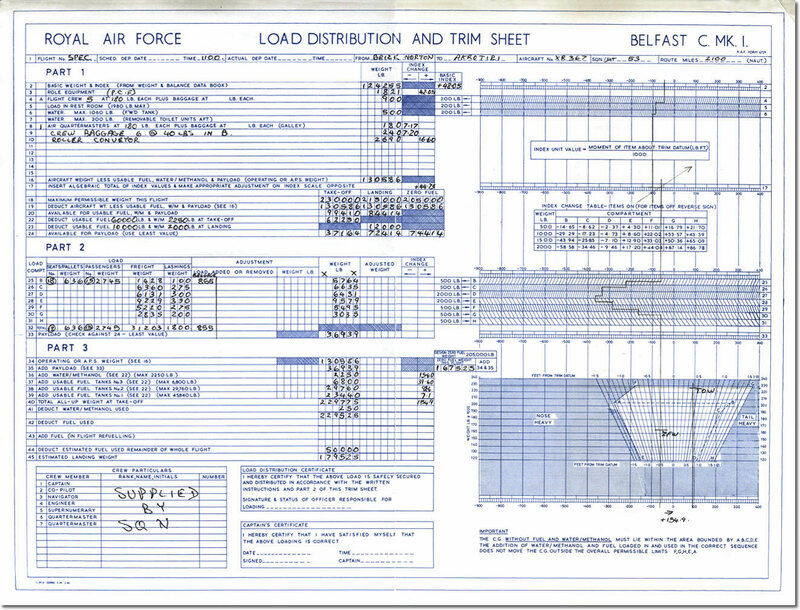 Subject the Nimrod feature, during 1994-95 I spent some time on the Nimrod Contract bid team at Warton. While quality was obviously an issue, we didn’t skimp on the quantity. When the day came to send the bid to the MoD, before loading the 3 copies onto their own lorry to transport them to London, they laid out the many volumes required alongside the demonstration Nimrod fuselage at Warton to see how much shelf space it would take, and the bid was longer than the Nimrod! Another story I picked up during this time, which I have no reason to disbelieve, was that because the original Nimrods were basically made by joining bits together rather than building the fuselages on one jig – when the fleet came to be measured, as a preliminary to the major modification and upgrade programme, the Nimrods were of different lengths, in some cases by several inches! Time I checked the Guest Book again. Interesting as always but sadly I cannot help with any of the requests. Hope everyone is keeping well with and without titanium hip!! Impressive. Photo taken at Gutersloh, the officer is Des Hadnett, noted for his strange signature (almost a cartoon) and wearing red socks in civvies and WO Keith Davis; he and his wife June were often the centre of the entertainment in the Old Airfield Lounge Gutersloh. Thanks for another good reading. I do not know a lot of the guys that write to you but I do recognize a few names.. I think the little guy on the right in this photo is Warrant Officer Keith Davies. You're too, too kind Babs! I was stunned to read of the death of Andy Wilson. I knew him from my days at the Movs School at Brize in the late '80's when he was a flight commander. His easy going manner and sense of humour made him a pleasure to work for. Thank you Mr Berry for bringing this sad news to our attention. My sincere condolences to his family, he was a true gent. 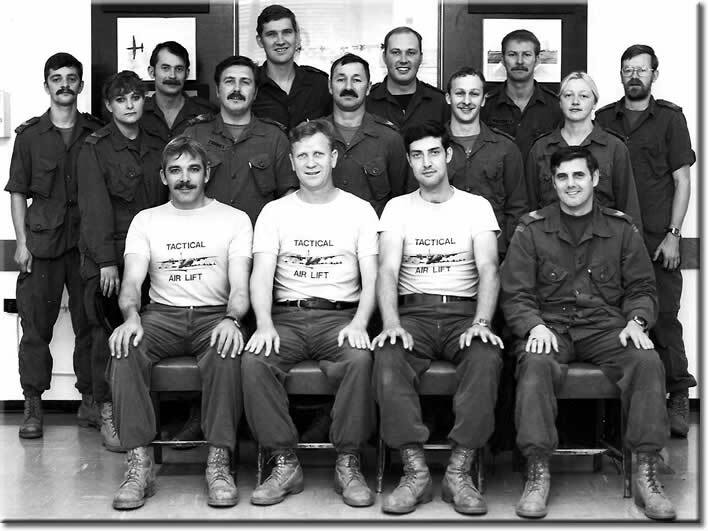 Just to wrap this one up, I was one of Geoff Clark's Flt Lts (3b2). We are still on Xmas card terms. One of his hats was as the Loggy Taceval Officer and I used to join him on two-man jobs. Usually came across UKMAMS in the field. Did a tour with the Beverleys in Eastleigh, then a couple on MAMS/UKMAMS at Abingdon but cannot remember a vertically unbalanced Beverley situation. How could they manage that? Subject: Kathmandu Resupply... a goats tale, or rather his head! I thought readers might like to hear about an unusual trip that occurred back in 1984. 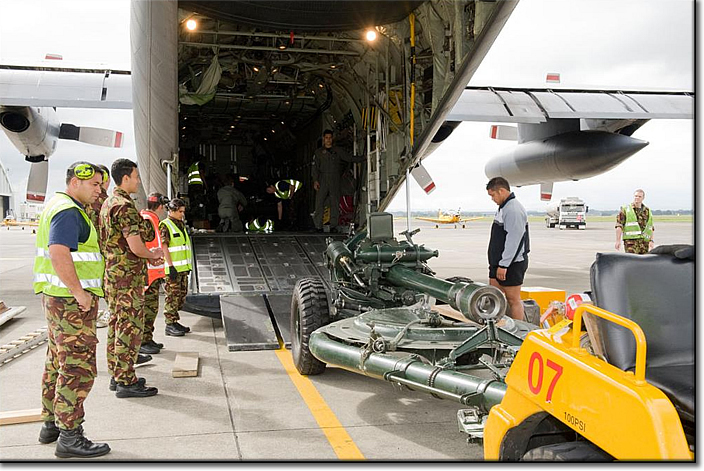 On the outside, it looked like a routine resupply flight of medical stores destined for the Gurkha hospital in Dharan, Nepal, and illicit drop off of Landrover spares, Quality Street chocolates and Marmite for the Ambassador in Delhi. At the brief, one unusual sentence in the Transop caught our eyes; the crew were instructed to uplift sufficient funds on the imprest to pay for the purchase of a goat, the reason for which I will explain. Our scheduled October arrival in Kathmandu coincided with the Hindu festival of Dashain and as such an offering is traditionally made to the Goddess Durga, to protect vehicles and occupants from accidents. In our case, the said offering was to be a goat. 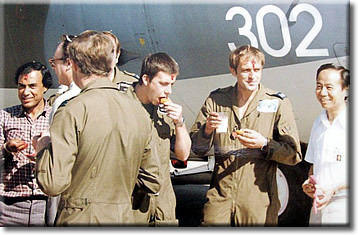 After a relaxing evening in Kathmandu, the team; Rich Morgans, Mick Day, Tony Geerah, Dibs Loveridge and myself, made it alive through the early morning death race that is Kathmandu traffic and arrived at the aircraft where we were met by the Air Attache, Squadron Leader Pete Auty. It's the curry house for you I'm afraid! The said goat was tied to a log next to the nose of our aircraft quietly munching away. It was about this time, that we realised the sacrifice was going to take place right here prior to departure. The Herc had been festooned with garlands of bright flowers, including some in the air conditioning intake! The priest was already there, together with some helpers and some of his family. The less squeamish among us gathered around to witness the dirty deed. While one helper held the goat on a lead, another grasped the animal's back legs and after a few words in Nepali from the priest the goat's head was severed by one clean blow from a large kukhri blade. The carcass was then dragged around the airframe to form a complete circle of blood, as is the tradition. We then had a red dye daubed on our foreheads as we were each in turn blessed by the priest. We were then given a curried egg and a small glass of rice wine to wash it down with. After thanking the priest and his team, we removed the flowers from the aircraft and stowed them in the cargo hold (for good luck). All in all, it was a fascinating insight into the Nepali culture. What we in the "civilised" world may consider barbaric is the norm in other cultures, and I learned to accept and tolerate foreign customs. I am indebted to Sqn Ldr Auty, who took most of the pictures, and forwarded copies to me. Interestingly enough, the blessing didn't work as the Hercules ramp broke in Bahrain on the way home! Thanks Gus - that's going to be a tough story to beat! From: Jack Riley, Hervey Bay, Qld. Movements Officer at Changi in 1949 EVERYONE was 'after my time '. In Turkey, turkeys are called "The American Bird"
Yet another fantastic effort with the website, regrettably tinged with sadness! Andrew J Wilson, ex DAMO Gutersloh circa 87-90... I believe it to be the same Andy Wilson who was at my wedding. Distinctly remember his initials; A J O W! A real gentleman with a quiet unassuming manner, however, under that exterior, he was truly a top Officer, he would back his team to the hilt if they were right. I remember clearly a roasting he gave an Army WO in Bielefeld over misuse of MMARS.. he put the phone down and calmly said "right that's him sorted, lets go for a beer"
Socially on off base tasks he was one of the lads big time. Even trying to teach us how to use chopsticks in a Chinese restaurant one night. 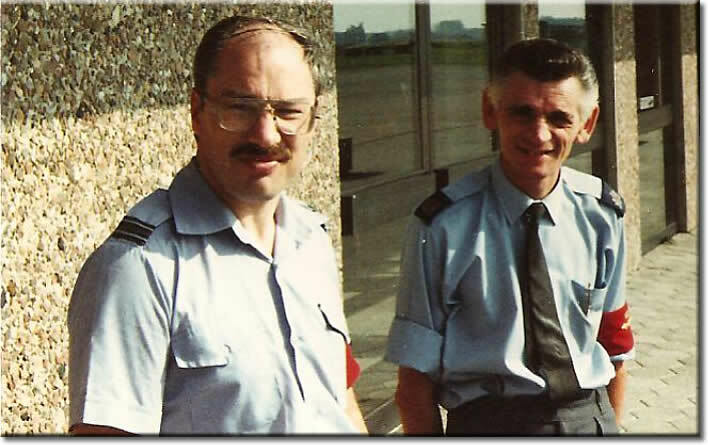 Heartfelt sympathy to Tess, Richard and Iain..
RIP Andy, you will never be forgotten..
Ironically in this latest brief, the mystery RAF foto is Gutersloh - don't know the names but spent many a shift walking past those doors which looked out towards the airfield..
Hope all are well. Just had to send this, we were out just to celebrate me feeling 3000%, been a long tedious time over recent years, but beware, cos now I'm back, no medication at all now. What you may say is just BRILLIANT. Bring the world on !. March 14, 2009: Britain is withdrawing all of its Nimrod reconnaissance aircraft from overseas, until all can have problems with fuel leaks and air circulation fixed. This is a major problem in Afghanistan, where the Nimrods have been very useful in providing ground surveillance and electronic monitoring. 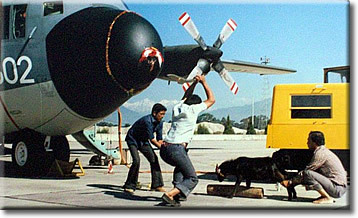 It was hoped some Nimrods could be kept in service overseas, but the need for repairs proved more urgent than expected. The main cause of the problems is age related. 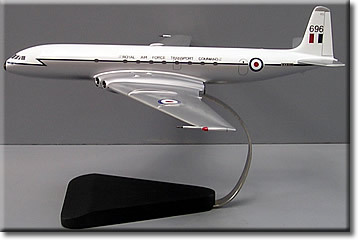 The Nimrod is a 1960s design that uses the airframe of the 1950s era Comet airliner. There has been work on a replacement aircraft, but money shortages, and disagreements over specifications, have delayed this. Crews have complained about the problems for years. The repair program was largely motivated by a Nimrod crash in Afghanistan in 2006, because of fuel leak problems, and the remaining 18 Nimrods are considered too old to be fixed by anything short of a complete rebuild. 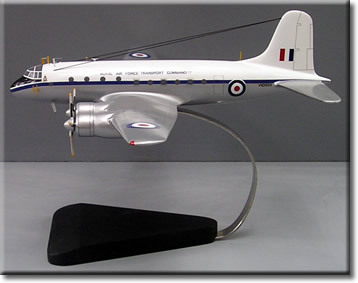 This is underway, but the first rebuilt Nimrod won't be available until next year. Three of the Nimrods are the R1 variant, and used as signals intelligence aircraft, and are considered essential over Afghanistan. Britain needs the electronic monitoring aircraft now. So they leased two U.S. Air Force electronic monitoring aircraft (RC-135 Rivet Joint) to fill in because of shortages. The aircraft will have joint British and American crews, but will be painted in Royal Air Force colours. A Wiltshire MP is pressing the Government over the future of RAF Lyneham. North Wiltshire MP James Gray says talks are still going on over whether the military base could become a helicopter HQ after Hercules planes are moved out by 2012. The Government responded to his questions by saying they are actively considering basing the operations of the Joint Helicopter Command at RAF Lyneham. But they said that the decision had been delayed as a result of an unforeseen range of complex variables and uncertainties. In a written question to Defence Secretary Bob Ainsworth Mr Gray asked for assurances on the future of the RAF base. But Mr Ainsworth refused to say how far talks had progressed on whether the base would be transformed into a joint forces’ helicopter base and would only say that it is one of a number of sites being considered. “There could be as many as 750 civilian jobs lost if it wasn’t kept as a military base,” said Mr Gray. “I know there’s been talk the site could be a used as a huge factory, or even a prison, but it makes good sense that it stays a military base. “The issue would be the level of refurbishment Lyneham would need in terms of accommodation to keep three RAF bases together – Odiham in Hampshire, Benson in Oxfordshire and Wattisham in Suffolk. In 2004 the Government’s decision to close RAF Lyneham, with its fleet of C130 Hercules J aircraft moving to RAF Brize Norton in Oxfordshire, provoked fury among residents and politicians. A Wiltshire County Council study estimated the base contributes £25m a year to the county’s economy. Council bosses warned the closure would have a devastating effect on businesses in Lyneham. Mr Gray also called on the Government to consider helping Lyneham to become a commercial airport instead of an RAF base. Oh bad luck! Hands up all those people who just opened an umbrella indoors? The right of A400M customer nations to seek contract termination at the end of the month is "very unlikely" to be exercised, says EADS, but formal negotiations on the future of the European tactical airlifter programme will not begin until the deadline passes. EADS acknowledges that "as the A400M will not perform its first flight before the end of March 2009" the customer - European procurement agency OCCAR - has a contractual right to claim termination of the entire contract as of 1 April, if "a unanimous mandate of all the launch nations" is secured. Termination would trigger reimbursement of pre-delivery and other payments amounting to about €5.7 billion ($7.3 billion). Gallois notes that France and Germany have expressed a "wish to negotiate", while the British "have not said the opposite". EADS's company position is that termination is "very unlikely". However, some analysts dispute this view. "With governments so tight for cash and yet desperate to have a decent, reliable medium-lift military transport aircraft soon, buying C-17 and/or C-130J aircraft from Boeing and Lockheed Martin is starting to look like a much better option," says Howard Wheeldon, a senior strategist at BGC Partners. Richard Aboulafia, vice-president of analysis at the Teal Group, suggests there is "a very good chance that one or more partners will back out, leaving OCCAR with a serious problem and probably little alternative but to cancel the contract". 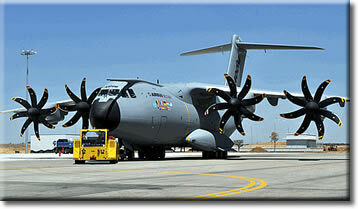 Under the A400M contract, individual customers have the right to cancel any aircraft delayed by more than 10 months. "That is another possibility - we can't exclude it," says Gallois. "But I don't want to overestimate the possibility because the global balance of workshare is linked to the number of airplanes taken by every country." He acknowledges that some customers "are in a hurry" to get A400M aircraft, citing the British and French air forces, and says that EADS is "ready to discuss bridging solutions to fill the capacity gap we are creating with the delays". Under "a new approach" proposed by EADS in January, first delivery of the A400M would follow a full three years after its first flight, with series production resuming only once "adequate maturity" is reached, based on flight-test results. The A400M programme schedule has been severely disrupted by delays to the full-authority digital engine control software that will control its Europrop International TP400-D6 turboprop engines. However, Gallois admits that EADS has "its own part of responsibilities for the fact that we are late", adding: "We are trying to mitigate the effect of that partly by reorganising the programme management." In December, EADS's Military Transport Aircraft Division was merged into Airbus to create the Airbus Military business unit. Previously, the programme's complex structure had been "impossible to explain to customers", admits Gallois. However, the merger met internal opposition, manifest in the recent departure of MTAD head Carlos Suárez. 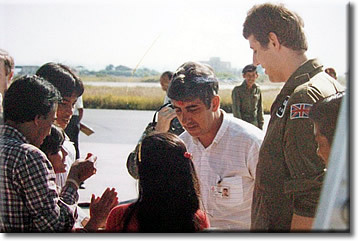 In keeping with EADS's policy, a Spaniard - Domingo Ureña-Raso - is to replace Suárez. From: Victor Smith, Brisbane, Qld. Just letting you know I am now out of my little sandy hidey hole and back in the Land Down Under. Arrived back in BRISVEGAS on Friday evening after three and a half months away. All is good although I do have a bit of an issue with the left knee and will have an MRI scan on Monday. Relieved to see that you've arrived home safe and sound Vic - take care of that knee a.s.a.p.! Out of interest, "Bris Vegas" is a name given to Brisbane in Queensland. The source of the nickname, which some believe to have come from the relatively more cosmopolitan cities of Melbourne and Sydney, has never been identified with certainty, although it has been connected with a Sydney Morning Herald headline, an Elvis Presley tribute CD and the city's growing live music scene. Let me know what you think by leaving a message in my guestbook. Subject: UKMAMS memories, Taff Price F team. Dave Powell's story of his gargling trick stirred up some memories of that time. We were at Luqa airfield Malta working 16 hours a day and night mostly unloading large pallets of ammunition, breaking them down to smaller loads and shipping them on to El Adem in Libya. After a while we discovered the ammo boxes were full of concrete rubble, training loads.Was somebody fly tipping or what? 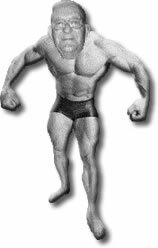 The other thing was as exercise bods we weren't allowed to use station messes and had to live on compo rations, one ten man box per day to feed fourteen of us, altho' a couple of double rums and coke usually kept me fired up during the night shift! Once in El Adem, I seem to remember spending most of my time back-loading empty water jerricans to Cyprus. It was really tasty water, and we always made sure that some were stacked to one side that became well chilled overnight. It did a fine job of getting the fur out of my mouth after a night on the beer. While there I caught a bout of tonsillitis, and no way was I going in to sick quarters, so at last on the flight back to base I waited till the"point of no return" and grabbed the Loadmaster who got the a/c Captain to radio ahead for an ambulance, and he gave me one of the aircrew Benzedrine tablets to ease my discomfort. Within ten minutes I could have got out and walked the wings, those 'bennies' were something else! Back in the UK I went in to sick quarters on the Sunday night and it wasn't until Thursday that a doctor stuck his head in the room and said, "Where did you come from, and how long have you been here?" He then took my temperature and threw me out! It's strange looking at your photo in the latest issue in that you are now about the size I used to be, and at the moment I'm down to the size you were in your young and fit days, but with all the aches and pains that go with age! RAF ground crews battled around the clock during the adverse weather conditions that the UK faced in February to keep the airbridge to Afghanistan and Iraq open. 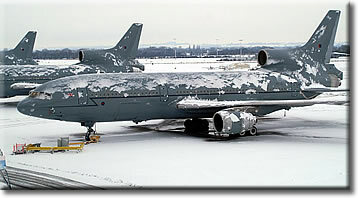 Despite temperatures dropping to as low as -10 degrees, and up to six inches (15cm) of snow lying on the tarmac, Service and civilian personnel battled the elements to maintain the fleet of RAF transport aircraft and keep supplies, equipment and personnel moving to and from the front line. Only two operational flights were lost as Britain was plunged into travel chaos when a blanket of snow covered the country, and the black top at RAF Brize Norton. The crews of 216 Squadron that operate the fleet of nine TriStar aircraft, configured to carry passengers including the injured, help to move up to 1,000 troops every week in and out of Afghanistan through Kandahar Airfield. The aircraft are flown to their limits nearly every day as the nature of the approach into an operational theatre is very different to the approach into an international airport. As a result, stresses on the airframes are much greater. Adding the problems that extreme cold weather can bring means the engineers on the ground are kept very busy. Flight Lieutenant Andy Climie, Officer Commanding TriStar Support, said, "First and foremost everything takes much longer when it's cold. "Because of the size of aircraft we can't put it in a hangar. Everything we do is still done outside and that poses us problems. Generally equipment gets cold but more importantly the troops get cold. "We have to cater for ice and frost on an aircraft, and de-icing it, which means despatching it takes longer but we still need to make sure the aircraft makes its take-off slot. "Snow and ice on the runway will have a massive effect on the aircraft and, like a car, its stopping distances. A drop in air pressure around the UK can have a massive impact on the aircraft's performance." The squadron is scheduled for seven flights a week, including two as reserve frames (or ghost flights) to cater for the unexpected. Back-up crews are also on duty to cover for any delays. Squadron Leader Jamie Osborne, 216 Squadron operations, said, "The airfield at RAF Brize Norton has the same problems as Luton, Stansted or Heathrow. 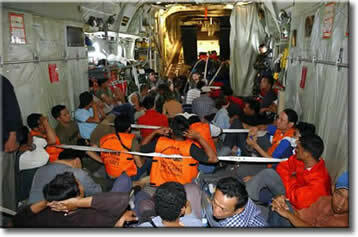 When the snow came there were seven or eight trucks out on the tarmac at any one time trying to clear it." 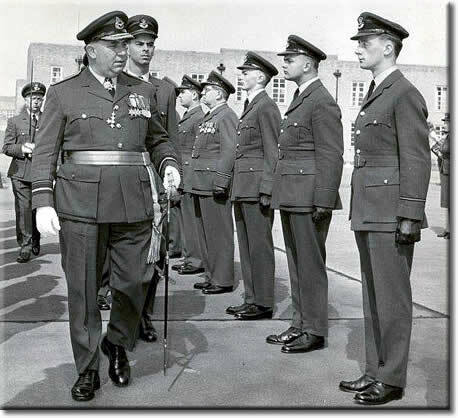 RAF Upward near Ramsey in 1965 - standing in line being inspected by Air Vice Marshal Le Bas (I think) were, from right to left, yours truly, Tony "Zebadee" King and Bob Powley. Now, what happened next was the small officer in charge of the General Duties Flight (carrying the sword at the extreme left of the picture) fainted right in front of me and the sword that he was carrying very nearly pinned the arse of the AOC as he fell. We kept smartly to attention whilst the debris was cleared up and the inspection passed by! Amusing memories! 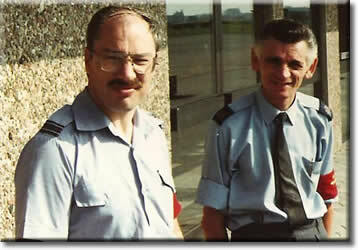 I thought you might be interested in knowing about Bob Powley - he retired as a Supply & Movements Group Captain. Since he retired he has found a niche installing computer systems for commercial firms. He is living in Cambridge but comes down to the Bristol area quite often and always stays with us. In one of the January Briefs my e-mail described the Comet 2 that brought me home from Aden in Jan 1957. Anyhow I recalled that way back on an earlier brief Martin Weir, of Niceairplanes, told us of his modeling company so I decided to have him make one for me and I received a photo of it earlier this week. 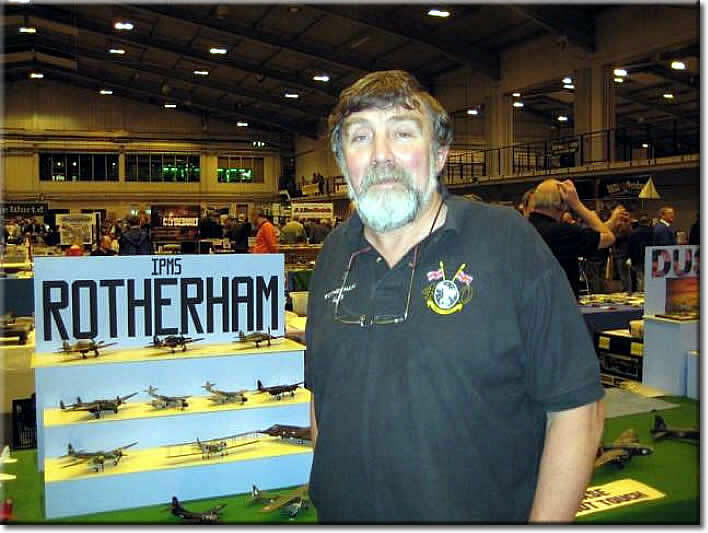 They both have about an 18 inch wingspan and you can see on the attached photos just how good his models are; he has quite an informative website showing all the models that he produces. We decided to replace our ‘ageing’ SAAB with a small BMW. 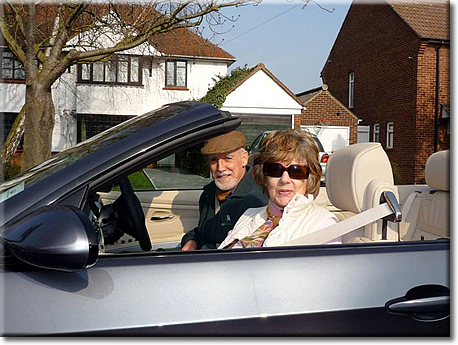 As the dealers could not deliver ours on time they gave us the use of a ‘brand new’ 320i Sport Cabriolet for the long weekend and the weather was beautiful! Legs now thinks we should swap our chosen car for this one, some women are never satisfied!